When asked about my education in a traditional public high school, I always talk about Mr. Gebler’s pre-calculus class. I remember it well for two reasons. One, I struggled to earn a C. Two, his standards — like his eccentric behavior and dedication to students — were so exceptional that I actually retained the content after the school year ended. A draft research report by workplace survey company Pairin confirms what I’d always known: Mr. Gebler was a top-tier teacher. 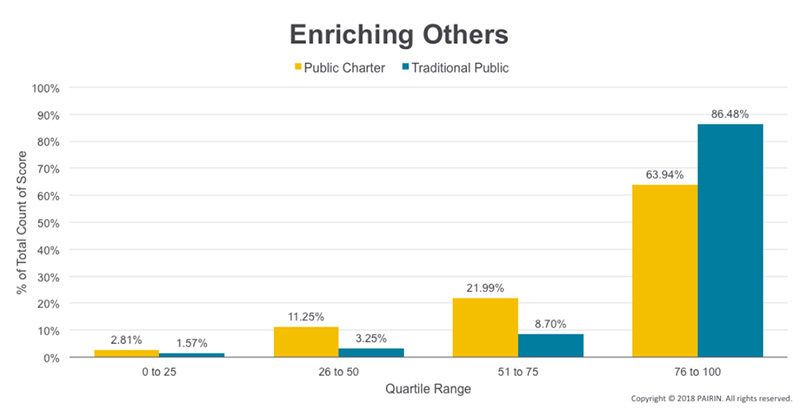 Pairin recently analyzed survey results from 9,359 teachers in traditional public schools and 390 in public charter schools. It found that certain behavioral attributes — motivation, independence, and the ability to correct others — correlate with high performance. Mr. Gebler had all of these. Today, however, many educators who share these behavioral qualities aren’t working in our nation’s traditional public schools. They’re working in charter schools. High-performing schools have to attract and retain high-performing teachers; the report indicates that schools designed to encourage teacher leadership and empower educators to take initiative do just that. Unfortunately, that’s the opposite of what most of America’s traditional public schools do. The data suggest we need a very different type of school system. The survey begins with a seven-minute questionnaire that evaluates 102 soft skills and mindsets. Participants are given a list of 300 adjectives, complete with definitions, from “touchy” to “humorous” to “spendthrift.” They select those that describe them, then go through the list again and choose those that they wish described them. Pattern-matching algorithms then build participants’ behavioral profiles. Many charter schools have teachers take the survey and then provide Pairin with a list ranking them by their performance. This helps the algorithm target behavioral attributes common among the top-performing teachers. Top performers have a high intensity for” “independence,” “assertiveness,” and “personal power: the drive to impact others and the world.” In general, they think creatively, manage relationships positively, and focus on making a difference over being compliant. The biggest disparity in behavioral attributes between top-performing teachers and others is that they have much higher intensity for the “ability to correct others.” Overall, traditional public school teachers surveyed had lower intensity for “correcting others” than charter school teachers surveyed. When compared with other professionals, teachers from all sectors have high intensity for “enriching others” — the ability to help people develop their potential. Interestingly, high intensity for “enriching others” accompanied by low intensity for “correcting others” can be a bad combination. Teachers with these qualities are often cheerleaders for their students, but they’re unlikely to hold them to high academic and behavioral standards. Likewise, teachers with higher intensity for “correcting others” might struggle to succeed in districts with uniform grading policies that force them to lower their standards. Simpson believes that workplace environments can change the behavior and mindsets of employees, including teachers, over time. These “can be the deciding factor between thriving and failing,” he says. “Teachers who are creative and independent might not thrive in an environment where the school policy dictates that everything must be uniform across classrooms.” He worries that, when placed in the wrong environment, idealistic, motivated teachers will become complacent or become frustrated and leave the profession. “What we’re finding is that systems that use job security as a recruitment tool either attract employees that are change-adverse or create an environment where being resistant to change brings rewards. The workplace mentality becomes ‘keep your head down and don’t make waves,’ ” he says. In that case, our bureaucratic education system might be to blame for the differences in behavioral attributes related to teacher performance. Traditional public school teachers tend to have behavioral profiles similar to those of state and federal government employees, Pairin found. They have high intensity for “deference: yielding respectfully to the wishes of authority” and “self-restraint,” defined as “the degree to which one holds instinctive desires in check and refrains from giving full expression to them in conduct.” People high in “deference” tend to be passive, resigned, and reluctant to share ideas; similarly, while moderate self-restraint can be a positive attribute, people with high self-restraint won’t express themselves for fear of “making waves.” As result, they often suffer from internalized stress, leaving them prone to burnout. Top-performing teachers have lower intensity for both self-restraint and deference than other teachers. 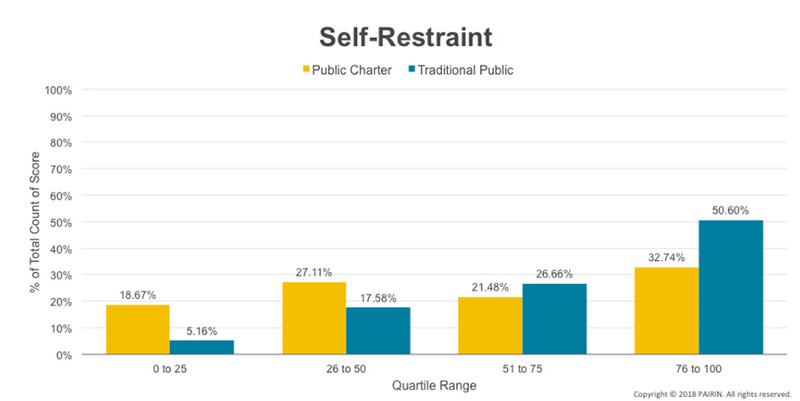 Yet, the survey results also show that most teachers — both charter and district — have high intensity for “initiative”; they’re self-starters who don’t wait to be told what to do. They also have high intensity for “problem-solving,” as well as “vitality,” the desire for a life full of zest and warm relationships. The data tell us that most teachers are independent, lively thinkers dedicated to their students. School environments, however, can either reinforce or hinder these behaviors. The traditional model for school districts, like all hierarchical bureaucracies, disempowers employees, ties them up in rules and red tape, and treats them all the same. To attract top-performing teachers, we need to change traditional public education from a bureaucratic system that prioritizes stability — “don’t rock the boat” — to one that embraces innovation, empowers its teachers to take initiative, and supports those willing to demand more from their students. Emily Langhorne, a former high school English teacher, is a policy analyst specializing in education at the Progressive Policy Institute. A former English teacher, Emily Langhorne is an education policy analyst and project manager with the Progressive Policy Institute.